Agghh – what can I say about this book other then GO READ IT!! 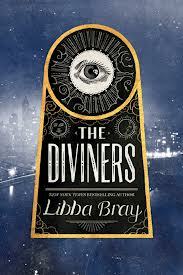 I came into The Diviners with no expectations – I’ve never read anything by Libbra Bray before – and I was just blown away. It is such a good book for fans of the creepy and spooky (me). I think the crux of my love for this book is the beautifully crafted 1920’s New York. It literally made me want to time travel back there. It never felt contrived – it was clear that Ms Bray did her research big time. It was so richly developed – with no stone left unturned and that atmosphere of flapper girls and smoke and clubs just made the book extra special. Then the characters, which there are a lot of. Evie O’Neill, our protagonist, has been sent to New York after a incident at a party. She is after a good time, selfish, and always has a witty comeback – a typical teenager. She definitely changes over the book – becoming mature and kinder but she never looses that slightly unique spark she has. To put it simply, Evie is a amazing character – I wasn’t ever annoyed by her and she wasn’t perfect and that made her so likeable and unique among YA protagonists. We also had Theta, a mysterious Ziegfield girl who has a hidden past, Mabel, Evie’s best friend who is ever so slightly more sensible, Memphis and Isaiah two brothers with hidden talents and Jericho and Sam, two very different boys competing for Evie’s affections (I actually enjoyed this sort of love triangle even though they usually make me want to throw the book away). The plot was also VERY interesting – murders were been committed and whilst Evie and her uncle Will helped the police investigation the other characters past and present were slowly peeled back. I loved the different viewpoints – it was like having little pieces of a puzzle given to you and I think this made the plot seem fresh and exciting. And this is all mixed with a dark paranormal presence and people having powers. The further you got into the book the more and more of these ‘diviner’ people were revealed and the end….ATGHJJJ..I want book 2 now!!! And I will definitely be reading Libbra’s other books!! I hope you are all having a lovely weekend!! O crap this is part of a series too?! I’ve been curious about this book and your review of it was really drawing me in, but I don’t think I can handle starting any more series that don’t have all the books published yet — I think this one is going to go on the “for the future” list!